It’s high-stakes election time. What do YOU want YOUR PUBLIC to DO? 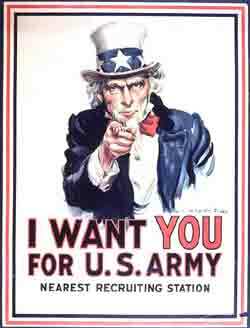 Riffing on the iconic “I Want You” army recruitment campaigns of World Wars I and II, TONY LABAT wants you to make your own demands of the public. What if you had one minute to seize the voice of authority? Would you want it? would you take it? what would you do with it? what would you say? * I want you to do the dishes AND clean the catbox. * I want you to get Russian troops out of contested regions in Georgia. * I want you to imagine what life would be like if you didn’t have to pay a mortgage, file taxes, drive in cars, or work for a living. YOU deliver YOUR slogan in solo auditions in the Wattis theater, before a panel of judges and Tony’s camera. The judges pick 50 finalists, who will compete in front of a live audience, American Idol style, next week, on September 11. 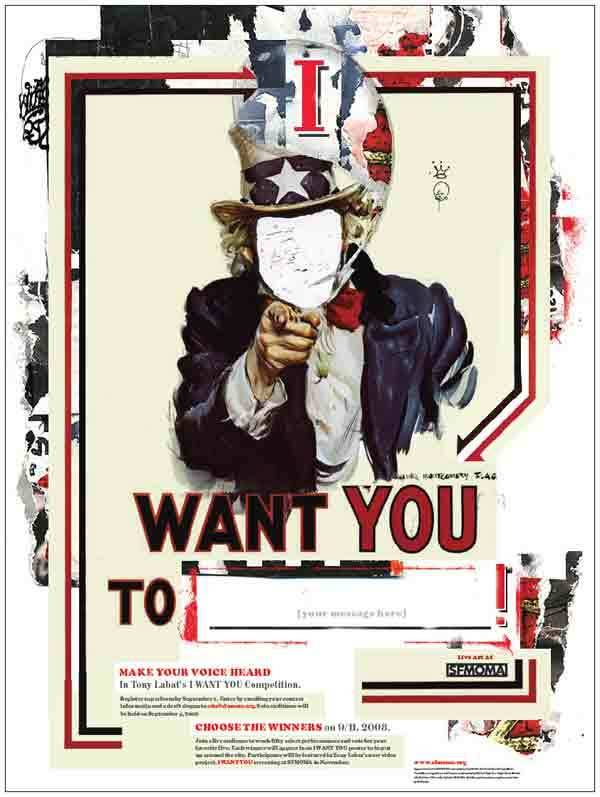 Five winners will find themselves & their slogans transformed into I WANT YOU posters to be plastered around the city before the November elections. Everyone who delivers a slogan on September 4 will be videotaped, and Tony will turn the footage into a new video piece he’ll debut at SFMOMA on Election Day, November 4.